* The recent lava activity on Hawaii, the Big Island, continues to thrill viewers. After the lava reached the pali (hill) it advanced rapidly down to the coastal plain. Most recent reports indicate that the lava is about a half of a mile from the ocean. Currently, the best view of the lava is from the Hawaii County Lava Viewing area, which is open from 3pm to 9pm daily. 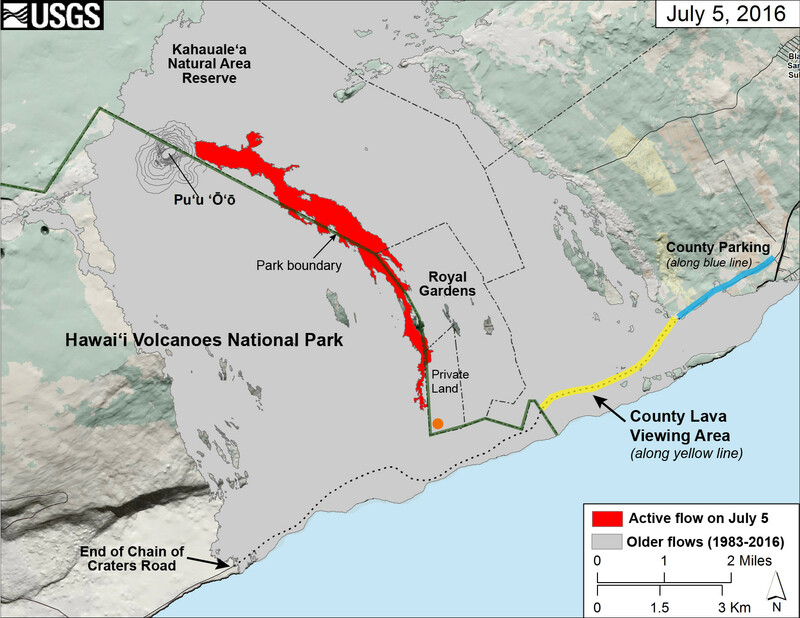 See this link for a map of the area and this link for updates from Hawaii Volcanoes National Park. This video update shows some incredible views of the lava flow. Here’s another amazing video worth your time to view. * Stays at Mauna Lani Bay Hotel are on sale via TravelZoo. It’s one of our favorite hotels on the Big Island. (See our review.) Rooms start at $239 per night. Upgrade to ocean view for another $80. the sale is valid for stays between August 21 and December 23, 2016. You must book the deal before July 20. * If you’d like a Waikiki accommodation with extra room and luxuries, but don’t want to pay the price tag for it, check out the Hilton Hawaiian Village suite sale. The sale is valid for stays between October 8 through December 28, 2016. You must book this deal by July 15. * Hawaiian Airlines has started to offer a bidding program for first class seats. * Speaking of Hawaiian Airlines, we’ve just learned that they’re offering their “seasonal best rates” starting at $378 roundtrip. Check fares here. You must book before July 14th and for travel between August 10 and November 10, 2016.